Above: The Sign of the Dog and Pot now mounted on top of a tall post. This is a ‘Dickens Story’ – not a story written by Dickens, like ‘David Copperfield’ or ‘A Christmas Carol’ – but a real life experience that Charles Dickens actually wrote about. It relates to a piece of street furniture called the ‘dog and pot’ that Charles Dickens knew and described in his own words. His memory of the ‘dog and pot’ went back to when he was just 12 years old. In later life he wrote in an essay ‘My usual way home was over Blackfriars Bridge, and down that turning in the Blackfriars Road which has Rowland Hill’s Chapel on one side, and the likeness of a golden dog licking a golden pot over a shop door on the other’. Sadly, the original sign over the original shop entrance has been missing for some years and the old shop is no longer there either. In fact almost nothing, other than the street layout remains from when Dickens was a child. 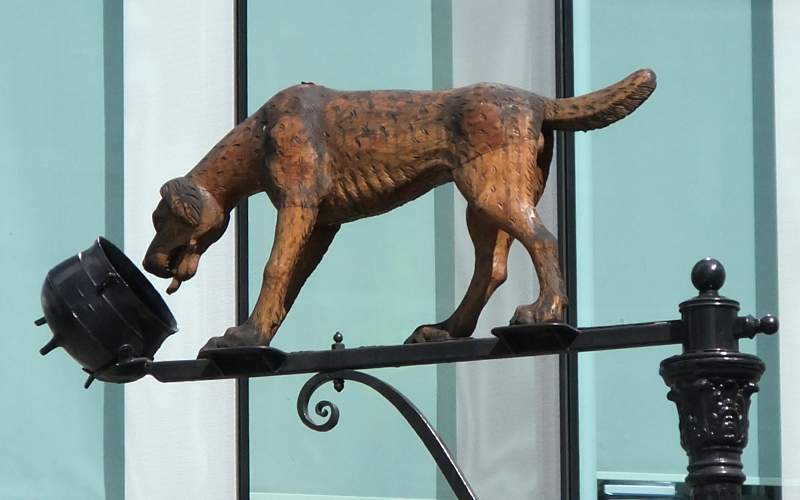 The dog and pot sign was over an ironmonger’s shop (on the south corner of Blackfriars Road and Union Street) for about 160 years. The sign was first displayed by Antony Walker who called himself a ‘Furnishing ironmonger, brazier and hardwareman’. In the 19th century, as Haywards and JW Cunningham & Co, the expanded corner business produced iron coal hole covers also featuring the dog and pot. The foundry was nearby on the south side of Union Street between Great Suffolk Street and Risborough Street. Above: Looking east along Union Street at the junction with Blackfriars Road. The chapel stood on the corner (to the left) and the shop was where the iron post is to be seen. A replica of the sign that Dickens described was unveiled in almost the original position, on the same corner as the shop. The design was based on one displayed at Southwark Council’s Cuming Museum in Walworth. It was held on the eve of Charles Dickens’ 201st birthday (6 February 2013) as the culmination of a year of bicentenary events. The site of Rowland Hill’s Chapel (on the north corner of Blackfriars Road and Union Street) is now covered by a large garishly-coloured office block called Palestra, in use by Transport for London. The new sign is surrounded by a paved area into which is set a plaque which bears the quote from the essay already mentioned. The sculpture of the dog is made from elm wood and has been carved by Mike Painter. The new dog and an original iron pot sit on a specially commissioned bracket created by Owen Cunningham which is mounted on top of a 4.5-metre iron post. 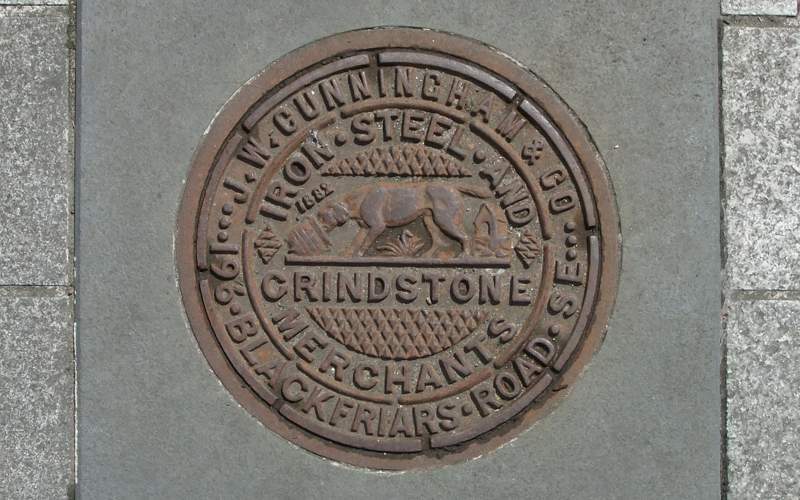 Above: The replica coal-hole cover with the dog and pot emblem. At the base of the iron post is a replica of a Victorian coal-hole cover with the emblem of the Dog and Pot. Perhaps it needs to be emphasised that it is a replica because it looks so authentic that you could easily be fooled into thinking it was an original. This entry was posted in /Sou-Southwark. Bookmark the permalink. Thanks Adrian. I went to a Herne Hill Society talk last Wednesday about the Cuming Museum and the recent fire. We were told that this artefact had sustained some fire damage. Yes, I believe that the original in the museum did suffer from the fire at the museum. 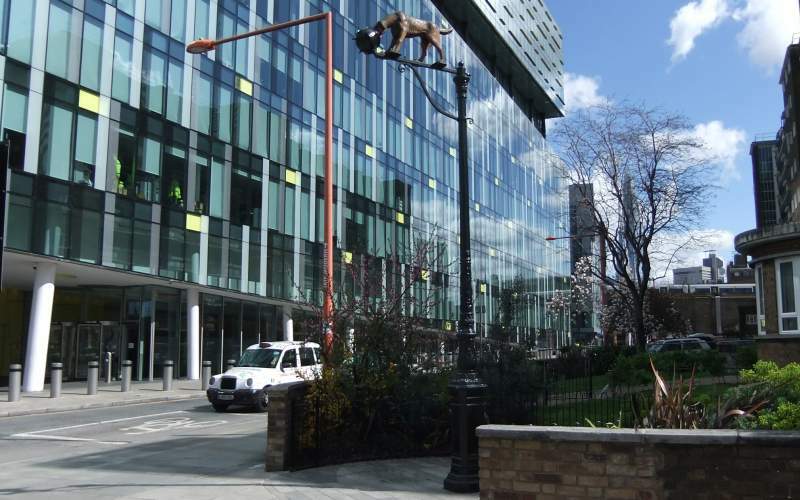 However, the replica in Blackfriars Road is as good as ever.